Harissa is a spicy chili paste used in Moroccan cuisine to add smokiness and spice to the dishes. It can be used to flavor couscous, soups or as a marinade for chicken or fish. The main ingredient of harissa is hot chili pepper. You can use any variety of chilies such as peri-peri, serrano, cayenne, etc. Recipes for harissa vary according to household and region. Some like it very hot, some smokier. Use the chili that you prefer depending on the desired heat level. For a lovely red color with less heat add roasted pureed sweet red pepper. Ready to use harissa paste can be found in the specialty food section of your grocery store. But you can very easily make your own. You can store it in a glass jar with a layer of olive oil for freshness (Olive oil creates a hermetic seal). How to make hung yogurt - Place a sieve lined with cheesecloth over a bowl. Put 1 cup yogurt on the cheesecloth, cover, and place in the refrigerator overnight. All the water from the yogurt will filter out into the bowl leaving a thick creamy hung yogurt perfect for marination. Use this for marination or as a substitute for cream in any recipe. A great healthy option. Cut small strips of chicken and season with salt. Mix harissa, yogurt, and honey. 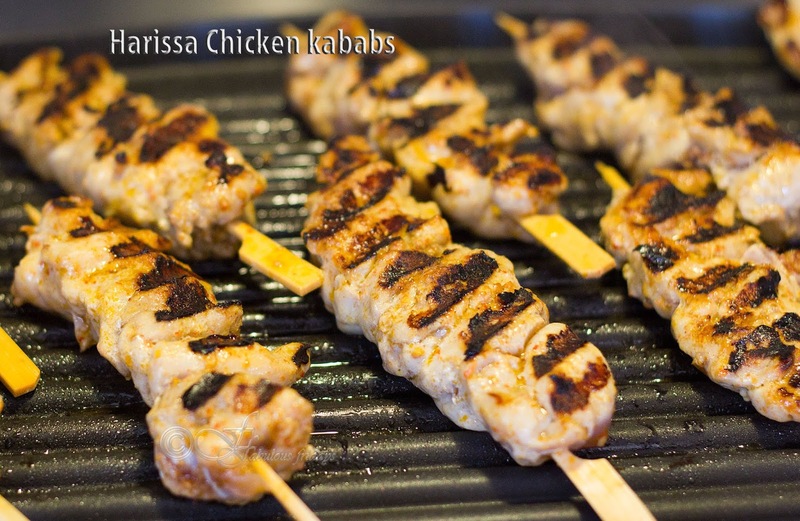 marinate the chicken strips in this marinade for a minimum of 4 hours. Thread onto the bamboo skewers. Grill on medium-high rotating occasionally till cooked through (about 15 minutes). 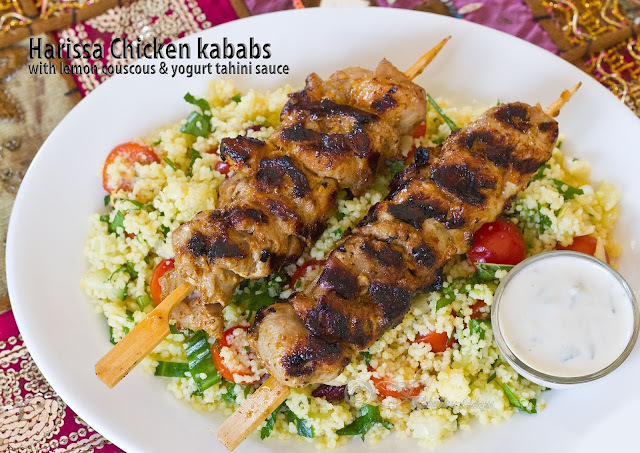 Serve over a bed of couscous or with warm pita with a drizzle of tahini-yogurt sauce (recipe below). This light tasting couscous salad is a perfect side dish with any BBQ. Incorporate any veggies in this such as red onions, peppers and any fresh herbs you have at hand. 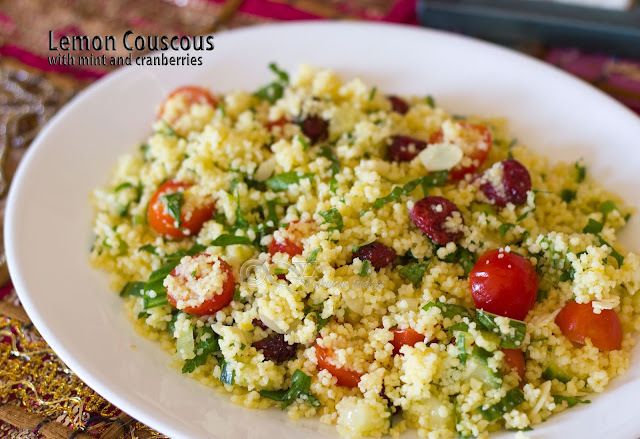 I love the flavors of tangy lemon, sweet cranberries, and fresh mint together. A refreshing dish you can make from start to finish in about 10 minutes. Take boiling water in a large bowl. Add salt and couscous. Mix well, cover and set aside for 5 minutes. Fluff with a fork, add all remaining ingredients and toss to combine.